the owner of multiple sites under one cPanel account? a designer or trainer who creates temporary sites? a webmaster that needs to know how to split multiple sites into their own cPanel accounts? 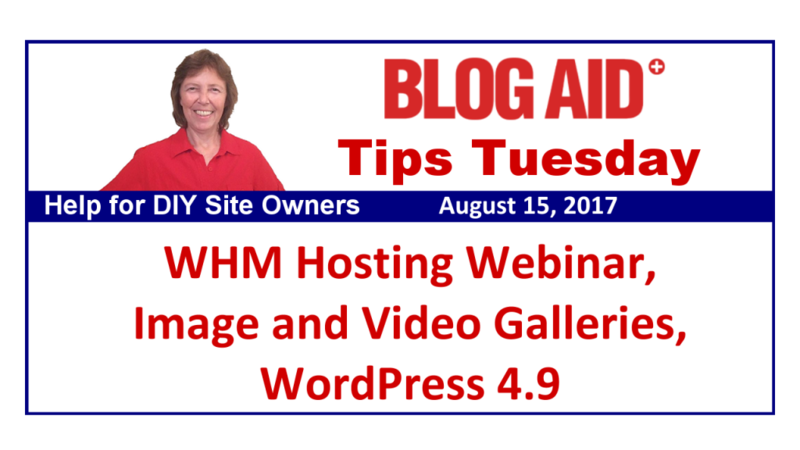 We go live this Thursday, August 17 with a tour of what a WHM account is and why it is a must-have for site owners who have multiple sites in one cPanel and designers and trainers who need to create temporary sandbox sites. And then next week we have a webinar on how to set up those cPanels in WHM. And the following week we have a webinar on how to split add-on and sub-domains into their own cPanels. It’s going to be a great series for site owners and webmasters. Get all the details here and register for the webinar so you can ask questions live and get the replays too. I’ll see you in the webinar!! How this WHM Webinar series came about was from me moving a site audit client who had multiple sites in one cPanel off Bluehost and to a shared A2 WHM Reseller hosting account (aff link) and then splitting all of the add-on domains into their own cPanels. WHM has the tools built in that make that easy to do. My Webmaster Training members got very excited about learning how to do that. My clients are overjoyed with now having sites that are already faster and infinitely more secure, and they want to keep going with putting their sites on the leading edge. We’re starting on the first of three HTTPS Conversions for that client this week too. Every penny and ounce of work they spent in the site audit and moving to better hosting has really paid off. It already made the switch to PHP7 fast and flawless. And now they are going to save a ton of time and money with the HTTPS conversion. And both of those things are going to make the site even faster because they will be able to take full advantage of the HTTP/2 protocol. HTTP sites use the slower HTTP/1 protocol to deliver all data in a serial fashion. HTTP/2 delivers everything in parallel and is way faster. Does Your Host Offer Free SSL Yet? And I’m really looking forward to doing the HTTPS conversion for a client who finally moved off InMotion Hosting. Not only was she missing security and speed, they don’t even offer free SSL certificates. None of the EIG owned hosts like Bluehost and HostGator do either. Talk about being way behind the times!! We also got her off the paid Sucuri Firewall and CDN, which is a wee bit cheaper than the paid plan at CloudFlare, but certainly not better, and not as fast, and definitely not as good for HTTPS. So she’s about to be all set for foundation site upgrades too. I am so proud of all the DIY site owners who have heeded my advice to get their sites squared away with PHP7 and HTTPS now. You really need to move these things off your to do list before the end of the year. Google is beating the drum on speed as an SEO ranking factor. And that drumming is getting louder and louder every day as they push forward with their Mobile First Initiative. And it’s not just Google beating that drum. Last week I told you how Facebook is now dropping Reach even further if you link to a slow site. Take the Seriously Old Plugin Challenge to get started with your PHP7 Compatibility tests. Then jump over to the HTTPS conversion page and see why you don’t want to do that the free way. You need to get all these foundation upgrades taken care of and make room for all the radical changes coming to WordPress. Two of those radical changes are already here – the Rich Text Widget that hit in 4.8, and then Gutenberg, which is the new text editor that is rapidly in development and already available as a plugin for testing. Everything about how you create a blog post is going to change with that new text editor, drastically. Get ahead of these curves!! The time to act on getting your site secured, fast, and on PHP7 and HTTPS is now. That way you won’t suffer speed penalties right now and you’ll be ready for the WP changes later. And they are going to be here faster than you think. More on that in a moment. I’m so delighted for one of my Scratch to Published training clients!! We’re in the final stages of getting her brand new site ready to launch this week. I’ll have an announcement for you once it’s live, and I hope to be chatting live with the site owner soon too, so you can hear from her exactly what the process was like. Plus, you’ll get to hear just how tickled pink she is with how this new venture started with a bang. She’s been on fire with it. Work has already begun on WordPress 4.9 and it is tentatively scheduled to release in early November. The goals for 4.9 are mainly on the backside and are focused on improving coding edits for plugins and themes. In other words, the things that DIY site owners should rarely if ever touch, but will impact designers and devs. They are also making improvements to the Customizer, which some DIY site owners do touch, a little too frequently in my opinion. I’m positive me and my money making clients see zero need to use that thing. But that’s going to change by next year. I’ll have more for you on when it does. So, for the most part, and as far as it stands right now, site owners may not have a bunch of hoohaa to worry about with this next release, and aren’t we all grateful for that? Remember me saying that radical changes to WP will be here before you know it? January 2018 is the proposed date for merging the new Gutenberg text editor into the WP core. That’s only six months from now. They are working overtime to make it ready for the WP 5.0 release. But, all of it hinges on how well the merge proposal goes that is slated for this December. I’m following this trac very closely to gauge when to put together webinars for you to try Gutenberg yourself. I strongly advise you not to put the current Gutenberg plugin on any live production site at this time. Some of my clients who already have hosting with a staging site area or who have WHM hosting accounts are doing what I’m doing now, and setting up sandbox sites in their own cPanels to test the Gutenberg plugin. I’ll keep you apprised on the progress. Just please hear my advice to get all of your other site stuff squared away before these radical WP changes start hitting. You can see just how rapidly Gutenberg is being developed in their weekly reports. I was delighted to see this post from my fave fix-it guy in the whole world, Makis of FixMyWP. I’m revamping most of the older images on my carving site http://www.heartwoodart.com and need to add a watermark to them. This post from Makis explains how to do that in bulk. And for newly uploaded images too! What a super handy way to get that project done quickly!! Thanks Makis!! I love Foo plugins!! I use them on my carving site. They have a super post on how to use FooGallery to create a responsive gallery on your site, which is crazy important for mobile. Definitely check into all the different ways you can use this flexible little plugin. It rocks!! Video, especially livestream video, has revolutionized my BlogAid biz. And I can hardly wait to add video to my carving site and social platforms for it. I want a good way to display those videos in a gallery on my site too. That’s where FooVideo plugin comes into play. It’s like FooGallery, but made specifically for videos. Check out all the layout examples they have too. Certainly gave me a bunch of ideas. If you want another choice for a video gallery plugin, check out Envira. It has a lot of great features and layout choices too. And, you can see this handy tutorial on WPBeginner to get an idea of what the admin side of this plugin looks like too. Video for getting news out is so crazy important now. Want to ensure you see every livestream from the Facebook Pages you follow? It’s easy to do!! My buddy Krishna De has a nice tutorial for you. And be sure to get notifications from her too. She’s right on top of every video marketing news item and platform. She’ll help you get more eyeballs on your streams. And, do turn on notifications for BlogAid Livestreams on Facebook. That way you’ll be sure to see my BlogAid Today streams of tips and break news as it happens. Catch the Tips Tuesday recap and BlogAid Today Tips livestreams on the BlogAid Facebook Page. Thank you for the tips on Foo Gallery & watermarking! I’m going to check those out. I really do love Foo Plugins on my carving site. Let us know what you end up doing with them. I know you’ll make pretty things! !